Yeats, with his grand style, his "artifice of eternity," his "singing masters" (Blake and Shelley and the ancient bards), his heroic soul "fastened to a dying animal," has always seemed the sort of superman the modern age either must instinctively distrust or deliriously admire. Full of contradictions, a youthful admirer of Madame Blavatsky, a towering, austere, passionate mythmaker, a crosspatch metaphysician (see A Vision), his poems, nevertheless, are generally regarded as the major ones of our century. 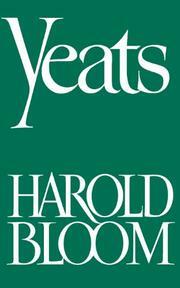 While not actually dissenting from this evaluation, Harold Bloom does ask us to turn a very cold eye indeed, not only upon Yeats the man, as does the usual left-wing critic with his proto-fascist labeling, but, more decisively, on Yeats the poet, so we may better understand what the glorious rhetoric's all about. "The Higher Criticism of Yeats, when it is more fully developed, will have to engage the radical issue of his subjectivity, particularly as it is expressed in his myth of the antithetical man." Yeats' dialogues of self and soul which suggest monologues, his phases of the moon and Gnostic wheel-turnings, his frequently insupportable images of History or Unity of Being, often seem, to Professor Bloom, solipsistic, or worse: a poet "does not cease to be a sentimentalist and rhetorician merely by declaring himself to be the possessor of a vision of reality, and there is much self-deception in Meditations." These are fighting words, but Bloom's a brilliant scholar. His argument, though perhaps built on rationalist or unimaginative premises, will clearly, as Bloom no doubt intended, cause a stir among the Yeats factions here and elsewhere.